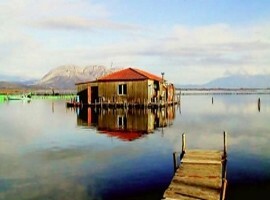 Messolonghi is a small and picturesque town, situated at the edge of the lagoon of Messolonghi. Its name derives from the Italian word mezzo-laghi (in the middle of the lake). The fist settlers of the place were Dalmatian pirates, who settled there because of the lagoon. It was a safety haven and it had abundant fish production. 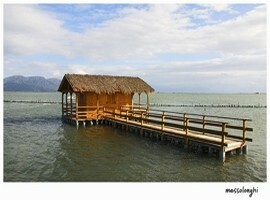 They lived in huts standing on poles over the water level of the lagoon. The town gradually developed a significant merchant marine fleet. This shipping together with the town itself was extinguished during a revolution in 1770. It was then build again and became heavily fortified during the Greek revolution of 1821. 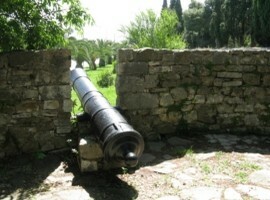 Messolonghi had been a major stronghold of the Greek rebels in the Greek War of Independence, having successfully resisted a siege by Ottoman forces in 1822. A second siege started in, 1825 by Re?id Mehmed Pasha whose army numbered 30,000 men and was later reinforced by another 10,000 men led by Ibrahim Pasha, son of Muhammad Ali Pasha of Egypt. After a year of relentless enemy attacks and facing starvation, the people of Messolonghi decided to leave the beleaguered city in the “Exodus of its Guards” (The Sortie) on the night of April 10, 1826. 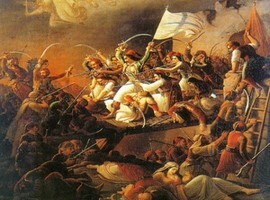 At the time, there were 10,500 people in Messolonghi, with 3,500 of them armed. Very few people survived the Ottoman pincer movement after the betrayal of their plan. 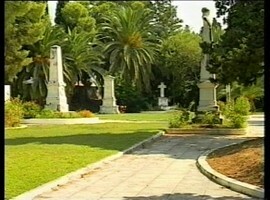 Due to the heroic stance of the population and the subsequent massacre of its inhabitants by the Turkish-Egyptian forces, the town of Missolonghi received the honorary title of the Sacred City, unique among other Greek cities. Today, the Entrance Gate remains intact and so does part of the fortification of the Free Besieged which was rebuilt by King Otto. Past the gate, there is the Garden of Heroes where several famous and some anonymous heroes who fought during the revolution are buried. 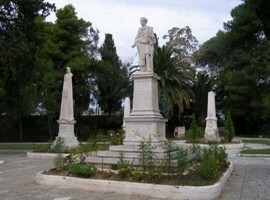 Bodies of unnamed fallen soldiers, are buried in a central tumulus; to its right is the tomb of Botsaris, and between the two, a statue of Byron erected in 1881, with his heart buried below it. The famous British poet and philhellene Lord Byron, who supported the Greek struggle for independence, died in Messolonghi in 1824. There’s a small museum in the central square, in the city hall, dedicated to the Independence struggle, which exhibits paintings and lithographs from that period, items connected with Byron, and a first edition of the poet Solomos’ Hymn to Liberty, which became the lyrics of the Greek national anthem.